This week's post is by Sakura, who blogs at Chasing Bawa. I am not sure how I first came across her blog. I think she comments on many of the same blogs I do, and once I must have clicked through to her site. 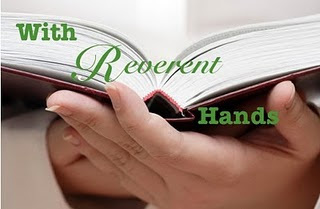 And its a great review site, featuring a lot of great books and good discussion on a lot of topics. Thanks for participating, Sakura! 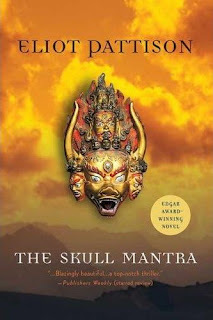 The Skull Mantra, by Eliot Pattison. I first read this about eight years ago when I stumbled upon it at my local library. This is the first book in a crime series set in modern occupied Tibet. Shan is a disgraced Chinese investigator who had uncovered one too many corruption cases in Beijing and is serving time in the notorious People's 404th Construction Brigade in Tibet together with political agitators and Buddhist monks. When a headless corpse in western attire is found on the mountain where the prisoners are building a road, the Tibetan prisoners fear that someone has awoken the horse-headed guardian demon Tamdin who protects the land. Shan is pulled out of hard labour and summoned to find the perpetrator. He needs to tread carefully, juggling the various agendas of the People's Army, the Justice Department and the Americans who say they are there to mine minerals, all the while making sure that his fellow prisoners aren't punished for any transgressions he might make. In a society where everyone has something to hide and where freedom is strictly monitored, Shan must first understand Tibet in order to understand the mystery. 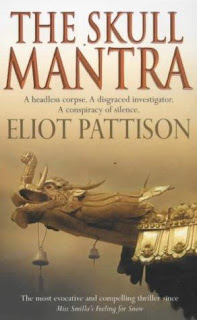 I didn't really know much about Tibet before I read this, but Pattison's book has opened up a new and profound world to me. His knowledge and love of the country really shine through his prose without a hint of spiritual preachiness. This is a well-plotted mystery through which you discover Tibet, learn about Tibetan Buddhism (which is more esoteric than the Buddhism practiced in South Asia) and most importantly, man's place in the world. Everything is connected, and when nature is unbalanced by a violent act, its reverberation can be felt everywhere. What I found particularly effective is that Pattison has made his protagonist a Han Chinese. It is through his eyes that we start seeing what Tibet is and what it means to its people. And the story isn't just a simple right vs. wrong, monks vs. soldiers or Tibet vs. China. Pattison paints an intricate picture of Tibet's struggle against Chinese encroachment. There are as many suspect Tibetans as well as the Chinese. This is a complex world where China has forced what was essentially a medieval society into the modern, severing traditions and the people's sense of identity which is deeply rooted in the land. Yet although you are left with a deep sympathy and anger, Pattison leaves you with a sense of hope in the Tibetans' struggle for autonomy. To me, this book was much more than a murder mystery and taught me a little more about life. And the sequels are all as good as the first. I'm not sure why, but I always equate this book with Caleb Carr's The Alienist and Preston Child's The Cabinet of Curiosities. Maybe it's because I read them around the same time. If you like your mysteries to be well-crafted, your prose superb and evocative and to learn about different cultures, I cannot recommend this book enough. Even if you don't like mysteries, I urge you to read it because it is so much more. They call it taking four. The tall, gaunt monk hovered at the lip of the five-hundred-foot cliff, nothing restraining him but the raw Himalayan wind. Shan Tao Yun squinted at the figure to see better. His heart clenched. It was Trinle who was going to jump - Trinle his friend, who just that morning had whispered a blessing on Shan's feet so they would not trample insects. Now this one sounds like something for me. I never read crime books, because of the silly reason that I find they are too scary for me (I am stuck being a little girl in that way forever, I'm afraid). I have to say that I love the concept of these posts and it's so interesting getting to know other bloggers through a forgotten book that they loved. I love the sound of this series, although crime books are not really my style, but I know nothing about Tibet and that side really interests me. I don't know much about Tibet, but it is a place that I have long wanted to read about. I also really like mysteries that are well constructed and that teach, so this does sound like something I'd like to read. The quote provided catches my interest as well. A great choice! I will have to look for it. Thanks for the great review, Sakura! Excellent... Thanks so much for this Sakura (and Aarti). I am very interested in Tibetan Buddhism and the political history surrounding the area. What better way to get it through an interesting novel. Now this sounds wonderful. The edition I saw a while had a very generic crime cover, so I didn't look closely. Clearly I should. Thank you for writing about is so articulately. "If you like your mysteries to be well-crafted, your prose superb and evocative and to learn about different cultures, I cannot recommend this book enough." Well, say no more! I hadn't even heard of this series before, but it sounds wonderful. Thanks everyone for all your lovely comments! I know crime is a niche area and I like to read crime with a dash of something else (usually history) but if you are interested, please give this book a try. Thanks again Aarti for a wonderful corner that highlights books that we might not normally read. Sounds like a wonderful book about Tibet. Thanks for the review! I know I'd learn a lot! Never heard of it. Thanks for bringing these books to our attention Aarti!